Without a doubt, this home on wheels is the ultimate freedom machine. 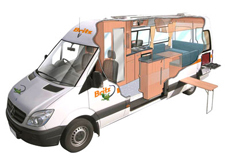 Mum, Dad & the kids, or even two couples will enjoy the open road in this 4 berth motorhome, complete with mini-kitchen and bathroom. 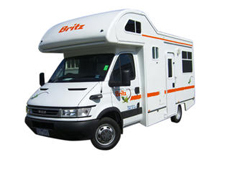 Hire the Britz Explorer and have an exciting Australian adventure. • Fuel: 10 litres per 100km approx. Child/Booster Seat Info This vehicle has positioning for a total of two child restraints. Two baby seats (three years and under) can be fitted to the rear forward facing seat with a baby bolt. OR two booster seats (minimum four years of age) can be fitted to the rear dinette seat with a lap belt. The type of restraint required for your child depends on their age. These pictures and specifications are indicative of the vehicle that will be supplied under your booking. Actual vehicles may vary according to year of manufacture and availability but your vehicle will be suitable for the required number of people and have similar specifications to those on this website. Specific specifications cannot be requested. All measurements are approximate, not guaranteed and specifications may change at any time without any prior notice. Actual vehicles supplied may vary to images shown, according to year of manufacture and availability. Licence - A current and full motor vehicle driver.s licence is required and must be produced upon vehicle collection. Should a foreign licence be in a language other then English it must be accompanied by a current international driving permit issued in the same country as the driver.s licence was issued. An accredited English translation will be accepted in lieu of an international driving permit. Age Restriction - Drivers must be 21 years of age or over. 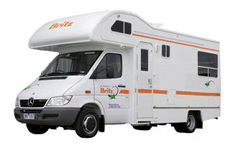 Campervans can only be driven on sealed/bitumen roads. 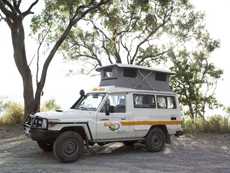 The only exceptions to this are well-maintained access roads of less than twelve kilometres to recognised campgrounds and well-maintained, recognised roads on Kangaroo Island (South Australia). Should a customer wish to travel on an unsealed road that is greater than twelve kilometres in length to access a recognised campground special permission can be arranged pending road condition, weather and distance. Please contact your local representative to discuss. Supplier reserves the right at its sole discretion to restrict vehicle movements in certain areas due to adverse road or weather conditions, and the distance to nominated destinations in relation to the length of the hire period. 4WD vehicles may only travel to the following areas with the written permission of Britz (please contact the local branch for further information): Simpson Desert, Strzelecki Track, Gunbarrel Highway, Cape York, the Bungle Bungles, Oodnadatta Track, Birdsville Track, Tanami Track, the Plenty Highway, Gibb River Road, Burke Development Road from Chillagoe to Normanton and Savannah Way from Normanton to Borroloola, Fraser Island*, Finke Road (between Alice Springs and Oodnadatta), Central Arnhem Road and Arnhem Land in general. Vehicles are NOT permitted to travel on the Canning Stock Route, the Lost City in Litchfield Park, the Old Gunbarrel Hwy, the old Telegraph section of the road to Cape York, Boggy Hole (Finke Gorge National Park) and the Old South Road from Maryvale to Finke, at any time. Vehicles are NOT permitted to travel to Cape York between the months of December to May. At all other times permission is required. The old Telegraph section of the road to Cape York is prohibited at all times however the bypass is permissible providing permission provided. 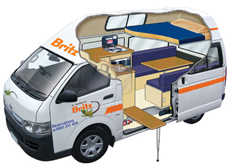 * The Britz Safari 4WD is not permitted to travel to Fraser Island where any objects are being stored on the roof of the vehicle. This requirement is legislated and fines, enforced by local authorities are applicable.